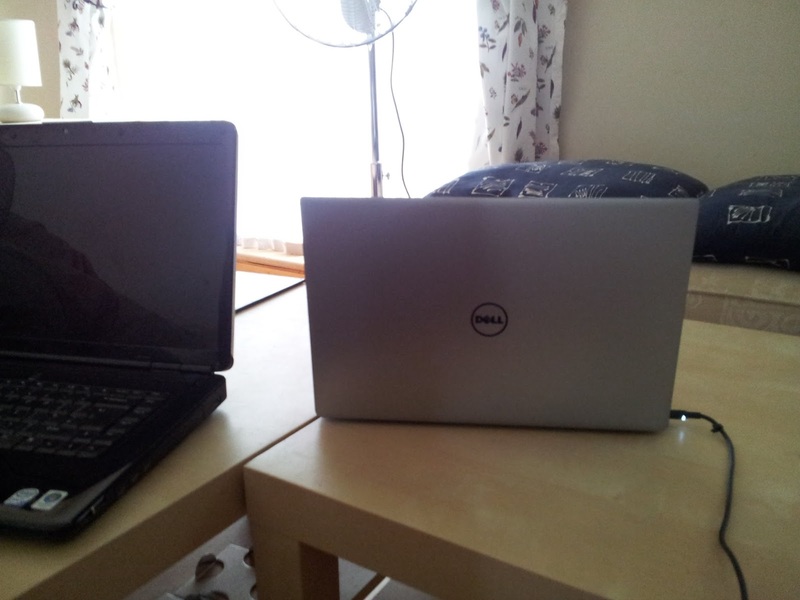 That Inspiron is a loyal old work horse that has served me well as both a dev laptop and file server for a decade. And has been my go-to machine whenever other, newer, higher-spec machines have failed. It's had its screen and hinges replaced. And has had its hard drive upgraded several times with various SSDs. So saying it has lasted 10 years is a wee bit Ship of Theseus-y. But the motherboard, fans, etc have all stood the test of time. However, it just isn’t fast enough any more for modern development, so I needed a new machine. After some research, I ended up opting for the Dell XPS 13. With 16GB RAM, 512GB PCIe SSD hard drive and the new 8th generation Kaby Lake Processor (i7-8550U.) I initially ordered the previous model. Which was identical in all respects to the above spec except the processor (it was an i7-7550U), and the price tag: the old spec was £300 cheaper. However, after reading several reviews that all suggested the improvement in performance with the 8th gen processor is significant, I cancelled and ordered the new spec. It cost £1649 in early November 2017. At this time, in late November 2017, it is now retailing at £1547 on Amazon. That’s quite a price change in only a few weeks. Not waiting a few weeks to see how the price settled is my only regret so far about buying this machine. The main thing that makes the 8th generation processor so much better is that it has a Quad Core, compared to the previous generation’s dual core. So, even with a lower clock speed, the newer processor burns through tasks like building Visual Studio solutions about 60% faster than its predecessor. That’s pretty significant. Performance gains are usually on the order of 10-20% increases between adjacent versions. As the newer processors have a lower speed, they also run cooler. So, except when you’re building solutions, you almost never hear the fan kick in. I've found that browsing the internet, watching videos, and even using MS Office are all silent experiences on this machine. I had heard that coil whine (a low pitched noise that accompanies processor-intensive tasks like watching videos) was a problem in the previous model. But I haven’t experienced that problem myself in the three weeks I’ve been using my new machine. Similarly, I had read reports of the wireless network card being unreliable; but my machine has performed perfectly. It hasn't dropped connection to my home wireless even once. Honestly, I’ve not used this laptop heavily as a development machine yet. Though I have experimented with running old Visual Studio solutions on it. A solution with 36 projects Builds in 1-2 seconds in Visual Studio 2015 Professional and VS2017 Community from a cold start. And Re-builds in about 15 seconds. That's amazing - better than any laptop or desktop I've ever had, full size or not, with or without SSD. On my old full-size Satellite Pro laptop with 1TB Samsung SSD, that Rebuild would have taken about 20 seconds. I should warn that there are some gotchas in VS2017. e.g., if you leave the Lightweight Solution Load option on (as it is by default), then the initial build time for that same project is about 40 seconds in VS2017 Community. Also, the solution sometimes doesn't build at all. So, my advice is to switch Lightweight Solution Load off completely. It's not stable enough at the current time to be of any use. Anyway, this review is about my XPS 13, not the poor design decisions of the Visual Studio 2017 development team. I mention these issues with VS2017 vs VS2015 purely to note how hard it is to assess new hardware if running new software too. Sometimes, it’s not the hardware that's to blame for any failings observed. Overall, like-for-like, my XPS 13 performs better than my old Satellite Pro + SATA 3 Samsung SSD. Even though that machine was no slouch. I’m glad I bought it, and will continue to use it as my main development laptop. In terms of battery life, the XPS 13 is a world away from any laptop I’ve owned before. Realistically, I get about 10 hours out of it if I’m just browsing the internet, or watching videos. As noted, I haven’t used it for actual development in anger yet. But going by the way the fan kicks when I build VS solutions, I’d suspect that I’d get around 4-5 hours max out of it at full throttle, possibly less. All previous laptops I’ve used have only got around 1-1.5 hours on battery, even if I were only browsing. So, whilst I have to be careful this doesn’t make me sit up too long at night. It is a huge improvement. That battery life is the main reason I bought the XPS 13 over its big brother, the XPS 15. 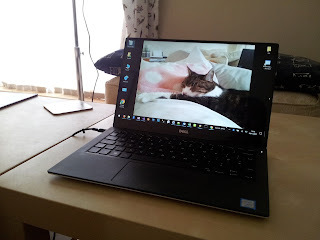 Every time I’ve bought a laptop in the past 10 years, my ‘sensible’ head has kicked in and coaxed me to go for raw power over portability and battery life. With this machine, I don’t need to compromise. It provides both ultra-portability, and processing power in one package. Whilst no doubt the latest generation XPS 15 probably could out-perform this model in sheer processing time. You can’t argue with sub-5 second builds in VS2015, combined with a full day’s battery life for commuting or using in the evening for lighter tasks. 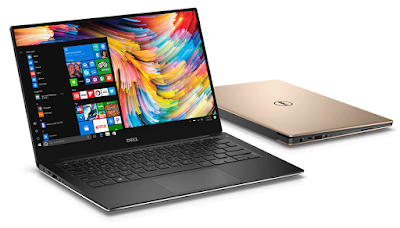 The XPS 13 has two features that I particularly like. Firstly, it has a nice, carbon fibre, rubberised keyboard surface. The keys themselves are pretty tactile, chicklet-style. As a touch typist, I find it suits me very well. But the palm rest is rubberised, which makes the keyboard pleasant to use if the laptop is cold. Had Dell opted for Aluminium all round, I think that would have made for some pretty cold hands when typing a quick email first thing in the morning. 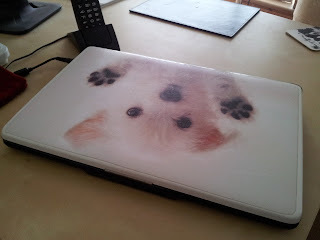 Or when transferring the laptop from a cold car boot to a warm office. Secondly, the keyboard is well-lit. With differing levels of white lighting available. Including "off." In a dark room, that backlighting makes positioning your hands far easier. Also, the keyboard light only comes on when you type; so it's not distracting if you generally want a keyboard light, but also don't want to be distracted by same when watching a video. My old Inspiron and new XPS 13 both have one design feature that I find annoying. Namely, there is a battery charging light right on the front of the machine. And it can't be disabled. It goes off when the battery is fully charged, but it'd have been nice to be able to switch it off electively. My old Inspiron battery has reached a stage where it doesn't hold a charge any more; it's therefore even more annoying, as it flashes orange to warn that the battery needs replaced. My new XPS 13 is too new to be able to tell if it does the same thing, though my understanding is that it will when the battery is too old to charge any more. It'd be nice not to have to use black electrical tape to switch this feature "off." Secondly, the webcam is badly-placed. I don't use it anyway, so it's not an issue for me. But if you do a lot of web conferencing, be aware that it is placed on the bottom-left of the screen. This is because the 13.3 inch display takes up nearly all of the height and width available. But it means that any Webex you have will involve participants looking right up your nose. Not pleasant. Other options I considered included the Razer Blade Stealth. (In the end, I decided the lack of a 8th gen processor, combined with the fact I could only get the “gamer” version with a green logo and rainbow-coloured keyboard lighting were deal breakers for me. Plus, support is US-based whilst I’m in the UK.) I also liked the HP Spectre very much indeed – it seems a very nice machine. Just not quite as capable as the XPS 13 in terms of power or battery life. Beautiful, though.